2.Dice tomato and capsicum into 1-inch cubes. 3.Cut, babycorn, into 1-inch length (finger thickness) pieces and boil till just soft. 4.Heat oil in a kadai, add ginger and garlic paste and fry for 3 minutes on medium flame. 5.Add chopped onions and saute till golden in colour. 6.Add red chili powder, crushed coriander & cummin powder , turmeric powder, , tomato puree and stir-fry for 1 minute. 7.Then add, capsicum and tomatoes. 8. Stir-fry for 2 minutes. Add paneer cubes boiled vegetables and continue frying for another 3 minutes. 9.Mix well and add the cut babycorn then add the sugar&,salt. 11.Simmer for a further 5 mins. Now, and the tomato sauce the fresh coriander. 12.And Serve hot in a small kadai with chapatis or parathas. 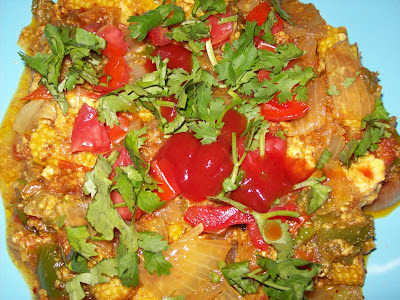 delicious curry with corns.....looks great.. Thank you suma for your lovely comments. kadai babycorn it sounds great. and looking yummy too..
Thankyou Andhraflavours,srihars kitchen,maheswari for your lovely comments.. yes maheswari,I like this template & looks refreshing..